What small business owner isn't looking for new ways to create engagement, grow their audience and make more sales? 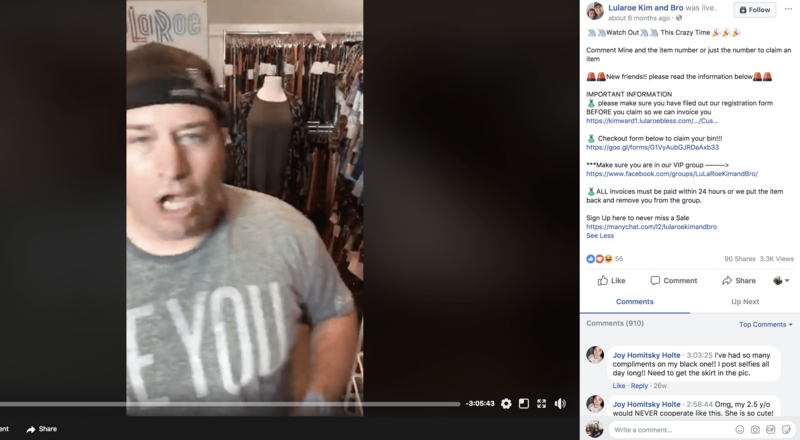 Kim and Ryan Ward were no different with their Direct Sales LulaRoe business when they were introduced to the magic of Messenger Bots and Facebook Live. When I started working with the Wards, they were selling LulaRoe clothing using Facebook Lives in their private customer group. The couple were looking to grow their business and find new ways to reach their ideal clients. They were bringing in $20K in sales and not using a Facebook Business page. 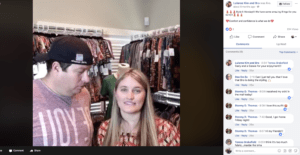 Kim and Ryan launched their first Facebook Live sale on a new business page Lularoe Kim and Bro on June 8, 2017 and received 200 views, 2 likes and 8 comments. As all entrepreneurs know, business building takes time and consistency, and the couples Facebook Live journey began. Embracing the new Facebook Live strategy, Kim and Ryan devotedly began broadcasting their sales live multiple times during the week. It wasn't long before their commitment paid off and the lives began gaining engagement and more viewers. They stepped into the magical world of Messenger Bots using Many Chat. The first Messenger Bot that Kim and Ryan used was a tool called a Facebook Comment Growth Tool. A Facebook post was created offering customers $5 “LulaCash” to use towards a future purchase. Customers could comment with the word “CRAZY” to be sent the $5 LulaCash via Facebook Messenger. 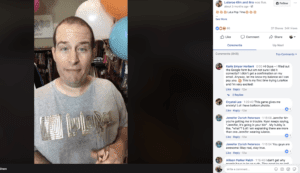 While customers joyfully participated to receive their prize, on the back side, they were also being added to the Ward's new Messenger Bot subscriber list as well as increasing the organic reach on the Facebook post itself. The new combo of Facebook Lives and Messenger Bots was a game changer. Seriously. Keeping a consistent schedule on their business page, Kim and Ryan watched their business grow. And grow and grow…and grow some more. 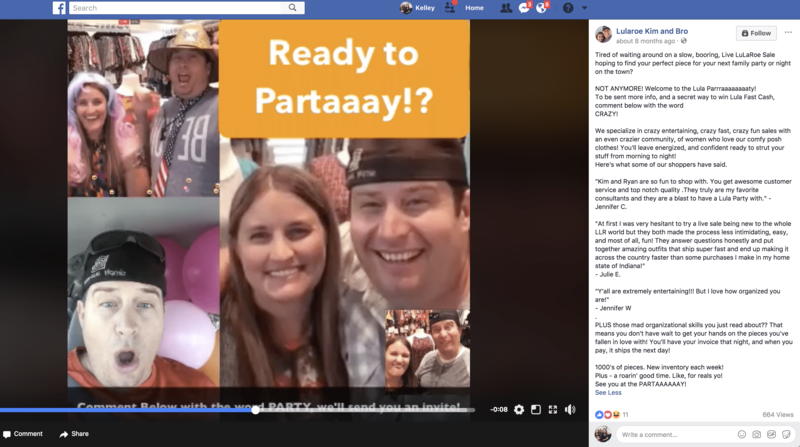 Two months later, their Facebook Live Sales on fire! In this one Live Sale, they get 3.3K views, over 900 comments, 55 likes and 90 shares. Holy cow! Only a crazy person would stop now and they weren't crazy! The Facebook Live consistency was paying off and the integration of the Messenger Bot was adding some extra fun and engagement for their audience all while increasing the organic reach on the Facebook Business Page. Take a look! Those numbers say it all! 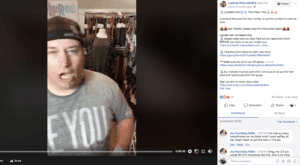 In just five months, Facebook Lives Sales were getting 24K views and over 800 comments. The best part, they more than doubled their monthly sales. I am so excited to share this with you! No matter what your business, Messenger Bots and Facebook Live is a simple system that works. If you want to add more value and fun and increase your leads and engagement, it's time to dive in! In case you'd like to up-level your skills while you are live so that you can welcome in new connections and clients, join us for our upcoming live video masterclass! www.LiveVideoMasterclass.com. I'd love to keep the ninja tricks flying at you!